3590EPXP: Version with attached printer. 3590E version: 12 Vdc via external power supply. All other versions: 110-240 Vac and built-in rechargeable battery. 3590EXP01CC Indicator with AF01 software, 2 IN, 4 OUT, RS485. 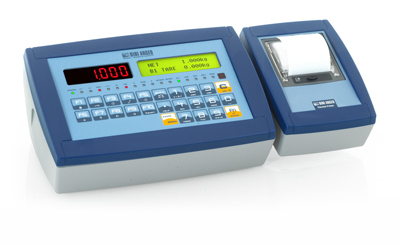 ABS IP65 case, 25-key keypad, LED display and backlit graphic LCD display. 3590EPXP01CC Indicator with AF01 software, printer, 2 IN, 4 OUT, RS485. ABS case, 25-key keypad, LED display and backlit graphic LCD display. 3590E Indicator with AF01 software and external power supply. Built-in rechargeable battery, RJ45 connector, glands and cups not included. TAKE NOTE: no option can be installed at the time of order neither any calibration or approval service. Options can be provided separately. 3590EXPN Indicator with completely customizable keyboard and software. 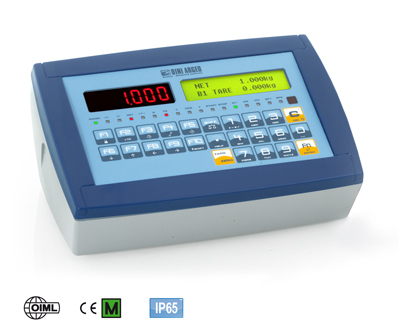 ABS IP65 case, 25-key keypad, LED display and backlit graphic LCD display.